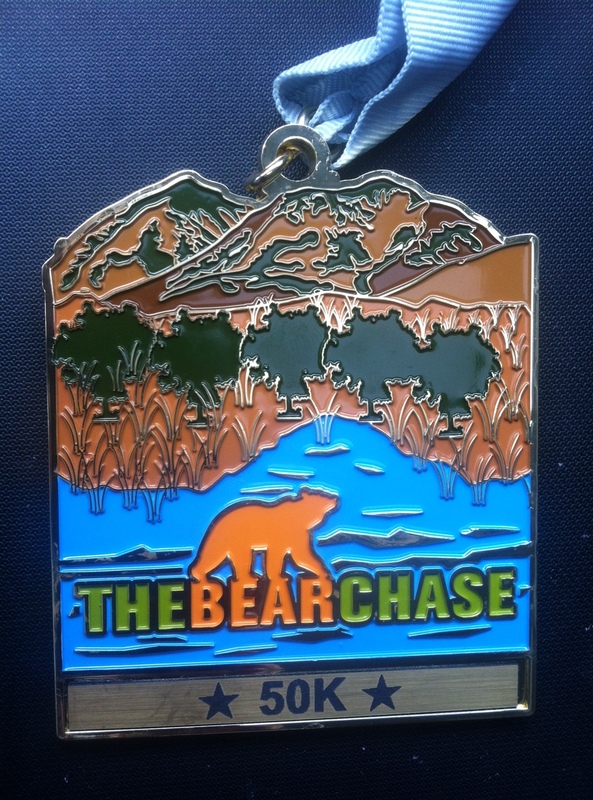 The preliminary results for the Bear Chase 50k: 4:55:32 for 28/190 overall and 10/45 age group (M30-39). Beat my previous best 50k time by 8 minutes on what I think was an equivalent course (at elevation here but warmer and more humid for prior PR race). People here are fast – when I ran 5:03 last year in TX I was 8th overall in, the Bear Chase winner was more than AN-HOUR-AND-A-HALF faster. Wow. Up by 3:30am after a night at the spectacular Boulder Sports Hall of Fame induction ceremony, I didn’t feel much. Not as tired as I would have expected, not as anxious, either. Normally I try to get everything dialed in just right before a long run, especially sleep and diet. Still half-stuffed from the tasty but less-than-ideal-for-the-night-before-a-race HOF dinner and fuzzy-headed from less than half a night’s sleep, I headed out to Lakewood in the dark. Typically, a few minutes before a race I’ll try to calm my nerves even while squeezing closer to the start line through the crowds. There were about 200 starters for the 50k, which started 20 minutes after the 50mi race. The race started and I just did what I do on pretty much every other long run: I went out slowish and just plodded along at a level where I didn’t feel like I was working. There were points I pushed a little to bridge a gap to the next runner(s) but mostly I approached the race as a simulation for the CR100. That meant hiking anything I couldn’t see the top from where I started, sticking to my 100mi nutrition plan, even wearing the exact gear. I figure if running 9:30 miles felt easy for 31 miles, MAYBE averaging 14-somethings for 100 will be possible. The course had a ~6 mile loop, followed by two longer loops to cover the total 31 miles. With about 2000′ of climb over the entirety of the race, it felt essentially flat with the exception of a one decent climb done twice over Mt. Carbon, which was really not much more than maybe 10 minutes of switchbacks that I hiked but could have run if I was really going for it. There were a few other hills and six ankle-deep water crossings to slow the pace but the rest of the course was perfect for speed for those who are speedy. Single track dirt, mostly exposed, with long straightaways and sight-lines of the course and a backdrop of mountains from just about everywhere. I never really suffered but also didn’t get any euphoric highs. I think that made for a solid race and my time reflected it. But, it is sort of a bummer to go out and race and not get the expected buzz and the emotional peaks and even a taste of the low times. Weird run, really – I just plugged away and was settled in from the start. I didn’t grab mile splits on my watch and final results with splits haven’t been posted but I’m curious if I ran as evenly as I suspect. I am quite sure my final mile was one of my quickest, as I figured I had 14 minutes to break 5 hours from the “One Mile to go” sign and I came in 5 minutes under. If I understood the posted race results at the finish, I passed 16 50k runners in the final loop, which is pretty cool. And, despite aching knees, I had plenty of energy even after my solo sprint finish. But, I think I’d have had more fun cruising around the high country with my Boulder buddies. The event was very well run from start to finish, with great pre-race communication, friendly support on course, smooth logistics, easy-to-follow route, nice size of field (all events reached caps), live tracking, race photos included, and quality shirts, medals, post-race food. Definitely recommended. Time to ease into taper mode, though I’ll still do a good bit of running over the next two weeks. Just nothing too long. I’m looking to fit in a run-hike trek of 15-20 mountain trail miles over the Continental Divide into Winter Park, where we’ll crash for the night before the return trip, for a total of 30-4o miles. But everything else will be either short and tough or medium and social. GZ- thanks! I might have been able to go sub-4 hours if only I had a beast of burden to tow me along, right? Mike, thanks for sharing the report. This race is a possibility for me next year. I’ve enjoyed reading your other entries too – very informative and inspiring for distance running and healthy eating. Looking forward to Monday night!